Helping the ACHAEANS? It is said that Odysseus entered incognito into Troy as a beggar. And being recognised by Helen, he with her help stole away the Palladium and brought it to the ships with the aid of Diomedes 2. Helping the TROJANS? But on a later occasion, when the ACHAEANS were inside the WOODEN HORSE, Helen went round it and called the different chiefs, imitating the voices of each of their wives. She did it so well that Anticlus would have answered, but Odysseus held fast his mouth, and when he tried to escape the pressure of the hands and Odysseus held him harder Anticlus lost his breath and died. Signalling: While Sinon, who having been left behind by the ACHAEANS during their pretended retreat in order to light a beacon lamp as a signal to them, started signalling with a shining brand beside the tomb of Achilles, Helen too was awake and signalling herself from her chamber to the Achaean fleet to return, for the WOODEN HORSE was inside the walls, the gates would open and the city was doomed. 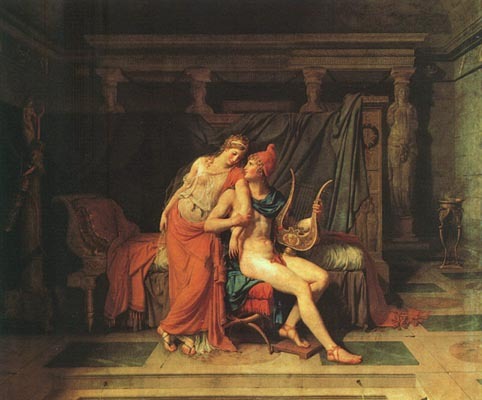 Back to her former husband: When the city was taken Menelaus killed Deiphobus 1 and led Helen to the ships. Having wandered for eight years in several Mediterranean countries Menelaus and Helen came back to Sparta. Some years later, Odysseus' son, still looking for his father, visited them in Sparta to see if he could get some news about him, and at that time it looked like Helen and Menelaus led a pleasant life in their city.